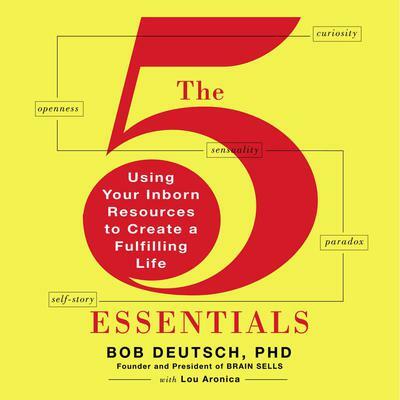 As a cognitive neuroscientist, anthropologist, and entrepreneur, Bob Deutsch has spent a lifetime studying people. What he has found is that most of us set the bar too low in our lives, both personally and professionally. We choose not to pursue our greatest ambitions because we feel we are incapable of reaching them. But he has also found that we are each born with the fundamental abilities to live the full, creative, dynamic life we dream about. Filled with great stories and interviews with inspiring people, including Wynton Marsalis, Richard Feynman, and Anna Quindlen, The 5 Essentials opens the door to a way of being more alive than you have ever been. In this compelling audiobook, Deutsch shows us how to access and use our five inner resources -- Curiosity, Openness, Sensuality, Paradox, and Self-Story -- to open our lives to unimagined possibilities.